Prokopios was born in Jerusalem of a father who was a Christian and a mother who was a pagan. At first, his name was Neanias. Following the death of his father, the mother raised her son completely in the spirit of Roman idolatry. When Neanias matured, Emperor Diocletian saw him and, at once, took a liking to him and brought him to his palace for military service. When this nefarious emperor began to persecute Christians, he ordered Neanias to go to Alexandria with a garrison of soldiers and there to exterminate the Christians. But, on the road, something happened to Neanias similar to that which happened to Saul [Paul]. In the third hour of the night there was a strong earthquake and, at that moment, the Lord appeared to him and a voice was heard: "Neanias, where are you going and against whom are you rising up?" In great fear, Neanias asked: "Who are You Lord? I am unable to recognize You." At that moment, a glowing cross as if of crystal appeared in the air and from the cross there came a voice saying: "I am Jesus, the crucified Son of God." And further, the Lord said to him: "By this sign that you saw, conquer your enemies and My peace will be with you." That experience completely turned him around and changed the life of Commander Neanias. He issued an order to make the same kind of cross which he saw and instead of going against the Christians he, with his soldiers, turned against the Agarians who were attacking Jerusalem. He entered Jerusalem as a victor and declared to his mother that he is a Christian. Being brought before the court, Neanias removed his commander's belt and sword and tossed them before the judge thereby showing that he is only a soldier of Christ the King. After great tortures he was cast into prison where the Lord Christ, again, appeared to him, baptized him and gave him the name Prokopios. One day twelve women appeared before his prison window and said to him: "We too are the servants of Christ." Accused of this they were thrown into the same prison where St. Prokopios taught them the Faith of Christ and particularly about how they will receive the martyr's wreath. For that reason in the marriage ritual of the betrothed, St. Prokopios is mentioned along with the God-crowned Emperor Constantine and Empress Helena. After this, those twelve women were brutally tortured. Witnessing their suffering and bravery, the mother of Prokopios also believed in Christ and all thirteen were slain. When St. Prokopios was led to the scaffold, he raised his hands toward the east and prayed to God for all the poor and misfortunate, orphans and widows and especially for the Holy Church that it may grow and spread and that Orthodoxy shine to the end of time. 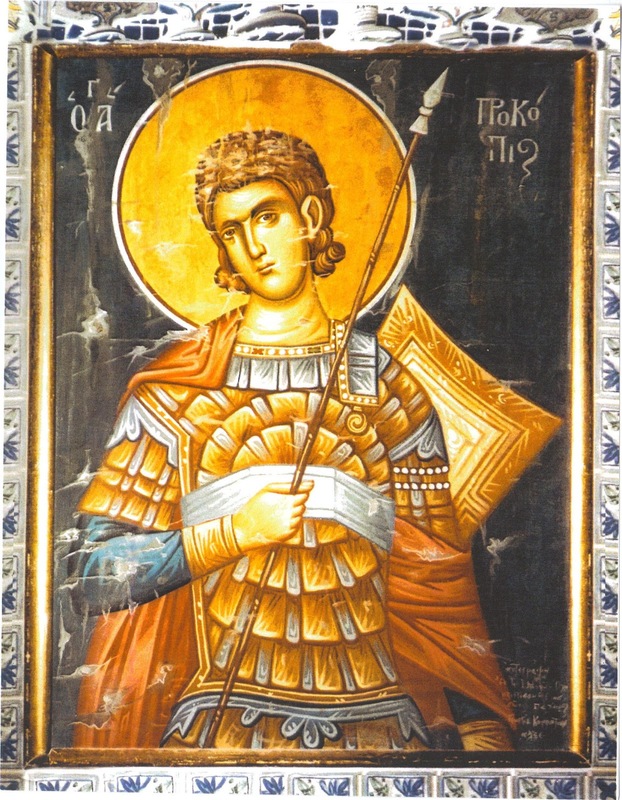 And to Prokopios there was a reply from heaven that his prayers were heard after which he joyfully laid his head under the sword and went to his Lord in eternal joy. St. Prokopios honorably suffered in Caesarea in Palestine and was crowned with the glorious wreath of immortality on July 8, 303 A.D.